and some of these are definitely worth to check out – saxist Christoph Irniger and his band Pilgrim as well as Pommelhorse the outstanding ones for me, next to the already more established one like Colin Vallon and Elina Durni. Beside the focus on the partner country, the festival has 3 more lines of programming: German Jazz Expo, European Jazz Meeting and Overseas Night. I didn’t manage to see any of the German acts (guess in the end I simply had to many meetings scheduled …), went instead to check out some of the Overseas Night acts like Canadian singer Laila Biali (photo above), whose simplistic version of Nature Boy was amazing to listen to and showed her immense talent and voice control, or the Aaron Diehl Trio (photo below), which used dynamics to a great result, keeping the listeners drawn in the music, surprising constantly and communicating on the highest musical level. A real outstanding show! Great too was trumpeter Amir Elsaffar and his Two Rivers Ensemble, whose blend of Arabic music and jazz reminded of Dhafer Youssef and Ibrahim Maalouf, but still had something individual to offer, as well as Kevin Hays’ New Day Trio. Here Hays focused on his piano playing and occasional singing and created a relaxed atmosphere for the trio to dwell in. The European Jazz meeting opened with the Trondheim Jazz Orchestra & Ole Morten Vagan and it started therefore powerful and bassist Vagan’s compositions got the best out of this remarkable orchestra, featuring as well violinist extraordinaire Ola Kvernberg. Modern Big Band Jazz at its best! A bit annoying was, that while the band played the announced last piece of the show, on the side of the stage some stage-hand held up a sign YOUR TIME IS UP and as they tried to finish the song the sign, a minute or so later, changed to STOP NOW !!! – for a jazz meeting and concert this is slightly out of place, even when a tight schedule of shows needs to be preserved. After more meetings on that Saturday I went to see the 20th anniversary celebration concert of the Norwegian Jazzland label at the NDR Sendesaal. I had the pleasure of working with Bugge Wesseltoft and Sten Nilsen, the two forces behind the label, for many years and I am still a great fan of the music these guys put out every year. Celebrations started with Beady Belle introducing the audience to some new material of her forthcoming record – with Gregory Hutchinson on drums, Bugge Wesseltoft on piano and Ole Marius Sandberg on bass. The new songs are really great and the band performed extremely well – not surprising Bugge ahead of everyone else with some incredible piano work. One album to watch out for! Then one of my favourite Jazzland acts took the stage – Hakon Kornstad with his ensemble performing music from his album ‘tenor battle’, which sees his tenor sax battle with his tenor voice … simply incredible!!! He is one of the most interesting young sax players in Europe, studied operatic singing for 3 years and now combines the two worlds he is living in musically to something utterly unique and touching – as the audience in Bremen experienced first-hand – most of them didn’t know what to expect and were moved to tears by the simple beauty of these melodies and Hakons performance and the acoustic sound fitted the venue perfectly – gig of the jazzahead for me! Then followed Bugge Weseltoft’s New Conception in Jazz (anniversary edition) and some awesome grooves and improvisations. The new band (Marthe Lea on saxes; Oddrun Lilja Jonsdottir on guitar; Sanskriti Shrestha on table and Siv Ǿyun Kjenstad on drums) did extremely well for only playing their second gig together – supporting the master keyboarder perfectly – this will only get better when they have played a few more gigs – looking forward to hear them again soon. The evening ended with a short set by Moksha, a new group on Jazzland Recordings, featuring Jonsdottir and Shrestha plus percussionist Tore Fladjord. A beautiful finale to a very special night! To many more years and to many more great releases from my favourite musical country: Jazzland! jazzahead is always worth a trip – lots of jazz to be discussed and business to be conducted, but first of all many great shows – and that’s what jazz is all about in the end: live performances that catch our imagination and heart. In a way music surely is magic –out of nothing sounds are created, connected and then give rhythm, melody and, in the best cases, emotions. The two shows I saw last week, as different as they were, both gave you the performers’ feelings and therefore could touch emotions within the listeners as well. Josemi Carmona, guitarist extraordinaire and Javier Colina, Spanish bass master presented, with the help of percussionist Bandolero, their new album De Cerca. From wonderful originals played as a duo or trio to some tracks with guest vocalist Antonio Montoya or with special guest Jorge Pardo on flute – this was all about beauty and melody. Josemi can of course do the fast runs on the guitar, but in general he is a flamenco player with a jazz feel that is based in melodic playing with rhythmic undertones – the beautiful version of ‘You and the night and the music’ is an amazing example of that approach. 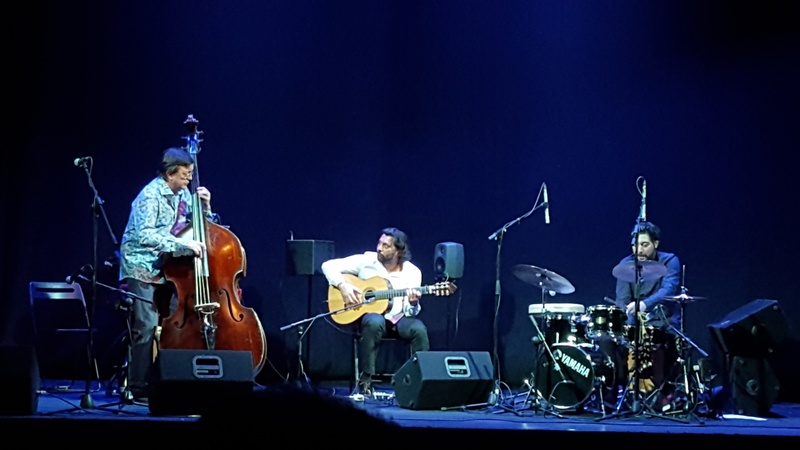 Colina not standing much behind with some of his soli being impressive in terms of ideas and expression and Bandolero has grown into a full flamenco drummer from the cajon player of early – sensitive in his support of the two masters. De Cerca is for sure an album worth listening to and if these guys come by any chance to your home town to perform – don’t miss it! 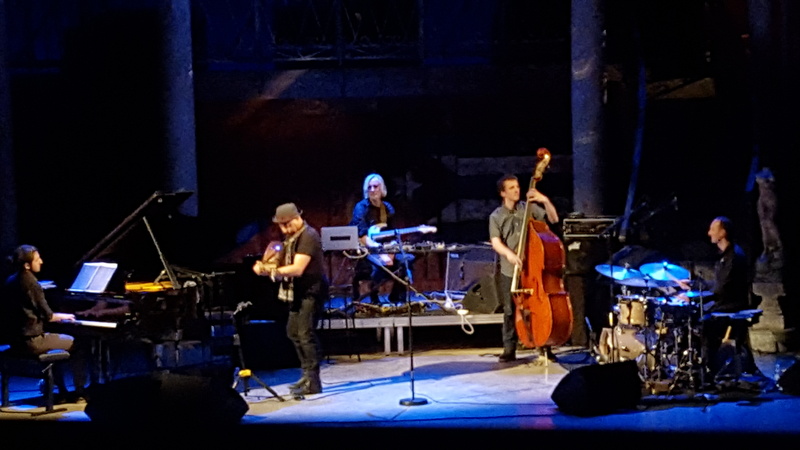 A different kind of magician is Dhafer Youssef, the Tunisian oud master and singer, who performed with his band at the Theatre du Chatelet in Paris on Thursday, April 7th. The venue (sold out with around 2000 people) was the perfect place for him – carrying his incredible voice in every corner of the hall, giving the audience the Goosebumps …. The band featured the young pianist Isfar Sarabski, Phil Donkin on bass and Ferenc Nemeth drums and long-time collaborator Eivind Aarset on guitar and they performed on an incredible level and supported the voice of Dhafer perfectly – grooving when necessary or supporting melody and ambient sounds when requested. Besides the incredible painter of sounds Aarset, especially new pianist Isfar Sarabski was a bit of a surprise with his almost classical touch in the ballads and his powerful sounds when pushing the rhythm. Beautiful as well in a haunting ballad that Dhafer just performed with him and Phil on bass … here the voice was just riding over the two other instruments in clarity and emotions carrying beauty, which is hard to describe …. Feel it and you will know what I mean. Not many voices can carry so much message without words, can touch by simply expressing emotions – and always ending in a uplifting tone. If you need a bit of magic in your life, music can provide it and Dhafer is one of the top artists in that respect. The audience in Paris definitely agreed with that and gave him a standing ovation plus asking for 2 encores … after almost 2 hours of music previously. Magic! R.I.P Gato Barbieri – Magic as well was when ‘El Gato’ took his horn up – the early Impulse Recordings or the Flying Dutchman releases … up to the softer Columbia ones … and not to forget that famous soundtrack … he took Latin Jazz to a new level and audience and I was glad to have seen and heard him in the 70’s – powerful rhythms and improvisation of the highest level. Unforgettable.